Welcome to our series, Mobalytics User Stories! Our primary goal at Mobalytics is to help competitive gamers improve and climb. Whether you’re new to League of Legends or a long-time player that has been stuck at a rank, we believe that we can get you through. This series will tell the stories of how Mobalytics has helped different players climb to achieve their goals and break their plateaus. The following User Story is quite impressive! 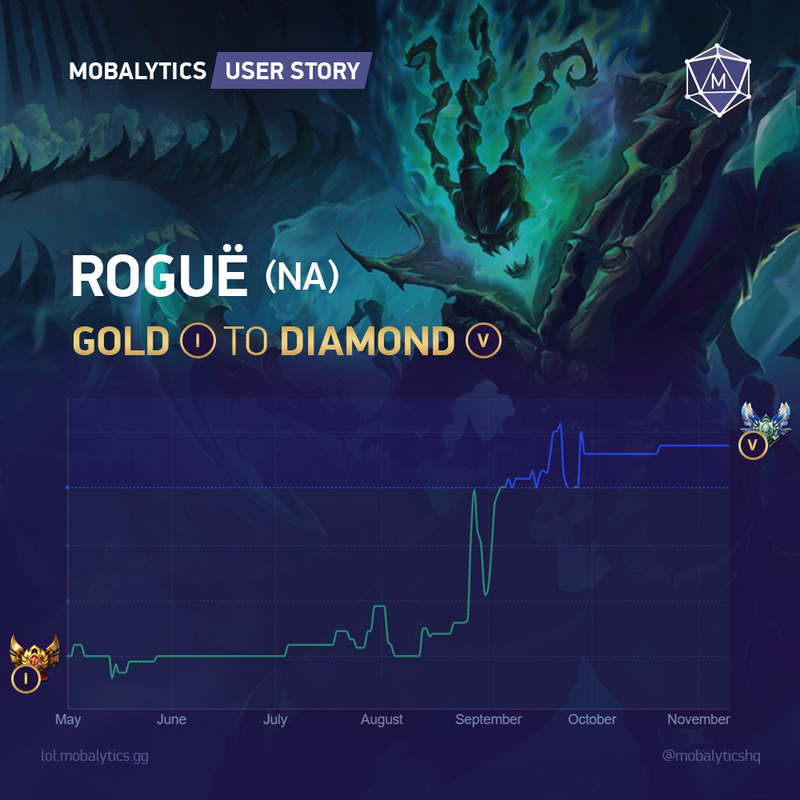 Roguë has climbed from Gold I to Diamond V while using Mobalytics. He’s a loyal Thresh main that has played him since his release and is targeting Masters next season. Outside of climbing solo queue, Roguë also contributes his time as a coach in the collegiate LoL scene. Stick around for the rest of his tale! First off can you tell me where you’re from and about yourself as a gamer in general? Of course, I was born in Arizona but I’m currently living in Michigan. I’ve been gaming since I was a kid actually. My mom had a Super Nintendo and we used to play Super Mario World together, then she shortly after bought me an Xbox and Halo when it was released. That’s awesome! Do you still game with your mom? Here and there, she has a few health issues going on right now that are more important. Ah, I’m sorry about that. We don’t have to include that part. It’s fine if you do, technically it’s who I am as a person. Honestly, I tried to keep it shortened because it’s legit a rabbit hole of health issues. How does she feel about how big gaming and esports have gotten? She thinks it’s great and she wants me to be involved with it more. I’ve shown her Worlds and things like that and she even comes and watches me play ranked here and there. That’s awesome man, she seems like a really forward-thinking woman. The world needs more people like her! When did you start playing League? What made you want to start playing and how did you find out about it? I was playing with a group of friends, they found League, and invited me to play with them. To be honest, I thought the game was dumb for the first month or two. The concept of “building a character then restarting next game” seemed so redundant to me. Haha! Was it your first MOBA? How did your view of it change over time to being more favorable? League was my first MOBA, and it changed solely off of ranked and the end of season rewards. I meant more like from a gameplay standpoint, like did you eventually embrace the starting at level 1 over and over again? Oh yeah, I did – it kinda just grew on me. It was almost like a new chance to prove myself from the start every game. I was thinking of it like that anyway. Got it! What was the journey like to finding your main role? Did you try them all out or did you gravitate to one or two from the get-go? I played every role at the start, then League released Thresh and I forever played Support after. Wow, that’s a tough champ to main, respect! 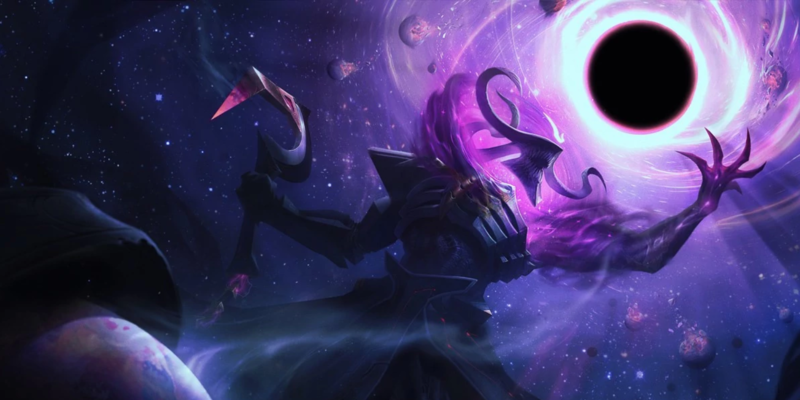 What did you like about Thresh and do you still main him today? Yeah, Thresh is pretty difficult, but I started right when he was released. I like to think that I’m an all-around type of person so with his kit having engage, disengage, and the ability to reposition allies, I fell in love. I’ve been maining him since Season 4. When did you decide to get serious about climbing ranked? Right away? Or did you play norms for a while? I went straight into ranked because it was the only thing that kept my attention on the game but I didn’t get serious about it until Season 6. Any Seasons before that, I mostly just focused on getting Gold for the rewards. Gotcha, so you were pretty consistent in getting Gold through Season 6? Yeah, from Season 4 to 6 I just wanted the skin. Sometimes, I finished Gold 5 barely getting it – other times, I finished Gold I promos to Platinum. How often did you play League at that time? What websites or tools did you use? You’ve made quite the shift! So you didn’t even watch streamers or Thresh Youtube videos? I thought I was the literal League god in human form back then…I didn’t watch any streamers or use websites like that until pre-Season 7. Did you have a humbling experience? What made you have a change of heart and mentality? I met a group of smurfs in a Flex game – luckily, they were on my team! Watching them play together and their synergy with each play they did blew my mind. I’ve since become good friends with those smurfs and talk to them. Some of my best plays on Support are with that group, I’m thankful I found them and respect them as people deeply. I bet you can’t wait until Clash comes out! We were bummed it didn’t work out this year. I’m actually sad about Clash. The one guy I play with all the time can’t play with me, I urged him to try out for his varsity team and he made it. Not saying I’m sad about him making it but he’s gotta play Clash with his team. Does he play for his university? If so which one? And I don’t think League is going anywhere for a long time, you can play more again when his tenure is done! South Dakota School of Mines and Technology, he’s showed me pictures of their esports facility and it looks amazing. I still play with him and I’ve even started coaching and helping his team in between their scrims. Hey, that’s awesome could you tell me more about that coaching aspect? Sure, I mostly just review their games and give pointers on what they need to work on. An example would be their Support – he’s had a bad habit of rushing Remnant of the Ascended instead of leaving it at Nomad’s Medallion, which doesn’t bring much value over finishing either boots or working on another Support item. I can’t really coach their Jungler much but I try to assist him with general knowledge and pathing as best as I can. Is this your first time coaching? Or did you have previous experience from traditional sports, etc.? I’ve been a helpful person in other video games I’ve played but this is my first time doing it to this scale. I have a bunch of their games in word documents and probably 50 hours of gameplay, either solo queue or scrims, on my computer to still go through. You’re a Support in game and out of game! I fell right into that role I swear! You fit it well. So when and how did you hear about Mobalytics? And when did you end up in our Discord? I found it myself. Playing with those guys, I could tell that I was the one behind. I didn’t want to hold them back even though they were on smurf accounts. So one night, I popped open that old Google and looked for websites to help me improve. I ended up in the Discord right after finding the site. I figured that if I had any questions I could just ask or reread the chat anytime I was curious about a topic. Google for the win! Do you remember when exactly that was? Season 7? 8? What was your rank before Mobalytics and what it is now? Before using Mobalytics I was Gold I. My current rank is Diamond V.
Do you use Mobalytics when coaching? We’re planning on making a version specifically for coaches eventually, so we’d definitely love to get your feedback when the time comes. Yes, I use it actively. I have their accounts bookmarked and I check up on them frequently. Oh sweet, please let me know when that’s live. Will do! That’s awesome what do you do with their accounts and how do you apply it to help them get better? Very cool! What do you personally find is helpful from Mobalytics? What’s your favorite feature? The GPI. Being able to glance at it and see where I’m, lacking and what I need to improve on is really helpful to me. Plus, I like filling out the graph completely and trying to make everything nice and even across the board. How often do you use Mobalytics when you play League? Every game? Every several games? Every game. Seeing the small improvements or declines in certain areas helps me adjust before going into the next game. What are some lessons that you learned along the way from Gold to Diamond? Be patient and take breaks. If you want to constantly play games back to back do them in sets of 3 almost like promos. If you win 2 of the 3 games, keep going, if you lose 2 of the 3, take a break and rewatch those games. How has your GPI changed along the way? In terms of the 8 Skills. Everything went from below 50 in every aspect, to above 80 in most of the skills. Very impressive! 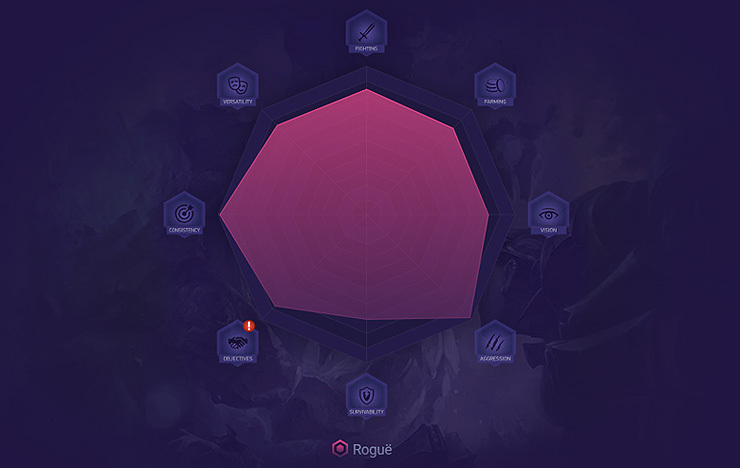 Which aspects would you say were your weakest when you first started using Mobalytics? Farming for sure, it looked so bad dude…it was a solid 15 I think. And you got it close to 80 now too? Sounds like you need to return for another review sometime! What are some new challenges you’re facing now at Diamond V? I’m not sure what I need to work on in fine detail. I’m pretty sure my positioning in teamfights isn’t the best right now so that’s probably the main thing. Are there any improvements or new features you’d like to see us make? Improvements…maybe just more community interaction as far as streams and things like that. Mobalytics has a helpful and fun community so why not embrace it more! Wow, that’s it? Okay, we can do that. No new tools or anything? What would be useful to you as a coach? I don’t know if it’s possible, but the ability to see where wards are placed. I’m pretty sure it’s not possible, but then again I don’t do programming. Like a warding map after the game? Yeah exactly. The university team’s Support once placed 13 Control wards in a game, I thought he was clearing and all that but it turned out he was tilted and dropped them in base. I didn’t find that out till I watched the game. Okay, got it. Cool, thanks for your feedback there. Lastly, would you like to see us expand to other games, if so which ones? I’d like to see you guys expand to Overwatch. I’ve caught a few streams here and there about it. Awesome, we’ll see what the future holds! Anything else you’d like to say? Only thing I have to say is, if anyone isn’t in the Discord yet, join. Everyone in it is super nice, helpful, and willing to share what they know about the game so you can improve. Also, if you are in the Discord, don’t be afraid to ask questions at all. Lastly, Moriarty needs to get back to the Top 50 of Challenger. Kappa. Just kidding, Mori is great, no flame at all. Thanks for reading! We’ll be doing more Mobalytics User Stories in the future so keep an eye out. If you’d like to tell us your story, find Agilio3 #8828 on our Discord server.